Many recordings state "September 29" as the date for this show, however, the "September Tour" of Slowdive finished on September 28. Either there's an error on the date, or Slowdive played twice in the Zap Club (28 and 29 September). 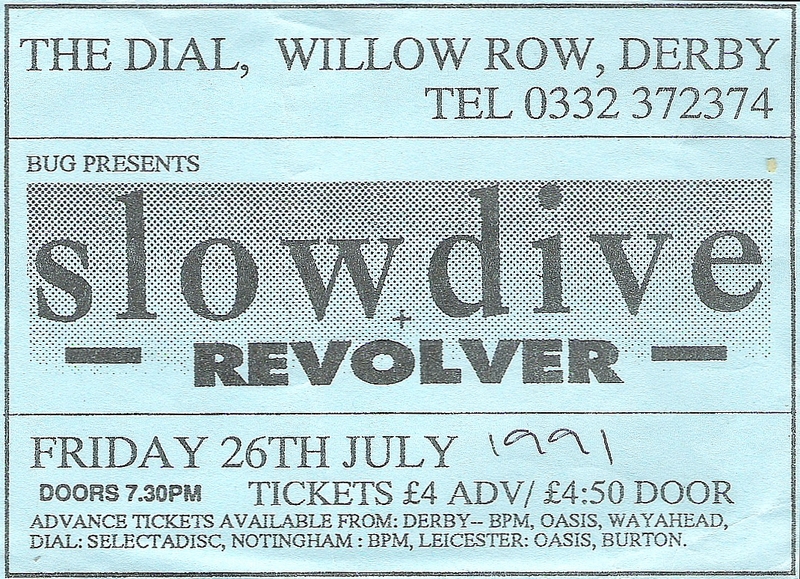 If you went to this show, please send us your ticket scan to confirm the date to info@slowdivedatabase.com Every help will be credited. "IS ANYONE feeling kind tonight?" asks Rachel Goswell, her hair the colour of conkers, as she coyly shakes her tambourine, and leads the Reading branch of the Triumph Spitfire owners' club into the eponymous 'Slowdive'. On the (self-satisfied) face of it, Slowdive would not appear to be a band unduly concerned with how anyone else was feeling, tonight or any other night. Their recent interviews, giving the impression of spoilt Home Counties kids with less appreciation of 'real life' than David Icke, have invited criticism quicker than you can look up 'incandescent' in the dictionary. And tonight's insular performance does little to dispel that swelling image. Slowdive's drowsy networks of sound, delicate as petrified cobwebs, are delivered with a tundra-proportioned coll that frezes any emotional warmth in the songs as surely as if they'd been dipped in dry ice. Rachel, looking like a coquettish Clare Grogan, but as aloof and untouchable as Greta Garbo, has a voice that melts over the shivering guitars, but frequently becomes lost amongst them, as she sounds exactly like the wispier notes of Neil Halstead's guitar. Unfortunately, Halstead's mellow murmur is uncannily similar in tone to Ms Goswell's, depriving the 'Dive of a sorely needed opportunity to inflame their work with a healthy dose of internal dynamics. Like Frankie Goes To Hollywood, Slowdive are very much a band of two halves. While Neil and rachel perfect their studied langour at the front of the stage, the three blokes behind them chew gum, adopt frisky rock poses, and yes - they actually DO study their footwear, but only when they play the fast bits. Each and every movement that Halstead makes, from respectfully striking his guitar to adjusting his Roger McGuinn fringe, is dlowed down to the pace of an arthritic snail queuing outside the GUM department store. The Slowdive rock'n'roll experience is not too far removed from viewing an Open University quantum mechanics lecture in slow motion. But this wanton lethargy, scored by the languid sweep of the occasionally beautiful music, is strangely compelling. Even stranger is the effect on the crowd. At home, Slowdive's Cocteau/MBV flavoured dreamscapes are custom-built soundtracks for doing nothing very much, very slowly. But here in Leeds, the young crowd see this as a command to switch to mosh frenzy mode, more akin to spending an evening with Guns N' Roses, than with the frightfully demure Slowdive. Perhaps sharing more territory with those appaling Cranes than the usual mandatory Moose/Chapterhouse comparisons suggest, Slowdive are more 'experimenters-of-sound' than mere 'purveyors-of-songs'. The final piece of the set, 'Avalyn', especially, was the breath-stealing rush of a chill gale whistling through a broken Cathedral door - a kind of 'Cranes with a proper singer'. Constantly honing and refining, Slowdive are engrossed in a relentless search for a moment of pure perfection, narrowly missing it on the rather fine 'Morningrise', and sailing within earshot as Neil and Rachel float through 'The Ballad Of Sister Sue'. They operate within eye-wateringly tight parameters, approaching similar sound structures over and again from different perspectives. Their music is a microcosm where avalanches of crystalline guitar are engaged in perpetual pursuit of slumbering vocals, doomed to play out ceaseless variations on the same theme, seemingly forever. Slowdive are not so much on the cutting edge, as on a glistening pinpoint. This piece, entitled 'Perverted By Languid' appeared in the October 5 1991 issue of New Musical Express. The reviewer was Jonny Thatcher. Computerised for 'Slowdive - A New Dream' by Darren (MusicManic). Catch other elements of sonic sophistication at my main site: Darren's Sofa of Transience. Slowdive and Moose supported Chapter House. CRAP intros to reviews part one: "Laugh? ", my Russian friend said. "I haven't had so much fun since the hardliners took over the TV network and began broadcasting sombre music and Open University repeats". Or, part two: Rumours that a letter from the local council urging all the bands to swear at the audience in a vain attempt to get them to say anything at all proved unfounded. But in a medium where interaction is limited to the brevity of a statement from the BCCI's lawyers or an LBC Yes/No phone vote, Slowdive won tonight's war of words with merely a simple "Hello" and a joke - "This one's called 'Slowdive'... oh, no it's not!" Axl F***ing Rose has nothing to worry about. This little gathering, mainly for the benefit of Radio One or GLR or Sky or something, highlights the problematic stage The Scene That Celebrates Itself has reached. Not even The Cure could effectively translate the gothic beauty of their essentially insular grief to the forced atmosphere of a live setting until they had enough spondulicks to play barns with state-of-the-art technology. Ask anyone to even shine, not to mention shimmer or glow in a tobacco sauna like the Marquee and you're onto a loser. Not even the return of Jesus accompanied by the Hallelujah Chrous miked up to Killdozer's PA could turn this overcrowded slum into, ahem, a s***c c****ral of s***d.
Nevertheless, if moose are anything to go by, reports of The Scene's expiry have been greatly exaggerated - even if it has been forcibly relocated to South Mimms(y) by the backlash. Stripped of their customary light and film show for the benefit of television, Moose, fill their plunge into darkness with even more strangeness. The thing that separates them from the blissful prettiness of much of the Scene is the tangible air of dispossessed menace they bring to their sadness - the lumbering bass of "Adam And Eve" or the dentist-drill guitar of "Boy" and the epic closer, "Do You Remember?" - the deafening sound you hear before the anasthetic drags you under, over and out. Slowdive have become the chief whipping boys and girls of the backlash largely because thos huge breathing Rothkoesque blocks of coloursound that characterised their EPs are missing or diluted on the new pastel "Just For A Day" LP - something they themselves seem to admit tonight as they stick close to the monolithic granite of "She Calls" or the guitar-smeared sodium blues and reds of "Morningrise". Last week, someone called Everett true registered mild surprise in his Reading review that Chapterhouse were on the main stage and not in the Mean Fiddler Tent. I register surprise that they weren't in the comedy tent. They say they're the product of the last 30 years of music. Correct: they'll certainly have nothing to do with the next 30. They're good copy but bad copyists, chancers who can't decide whether to be The Cure ("Breather"), EMF, or Spinal Tap ("Autosleeper"). They've listened carefully to the best bits of all those bands, discarded them, and used what's left. Worse still, it's all stuck round a camp, insipid beat so anaemic you could strangle it with two fingers without spilling your pint. Chapterhouse are so bad they make Blur sound okay. In recent months, the components of the Scene have noticable stopped celebrating each other as they begin to realise that they're not gonna be around next year. Of tonight's, only Moose look set to last the course. This piece, entitled 'Scene It All Before' appeared in the September 14 1991 issue of Melody Maker. The reviewer was Mat Smith. Computerised for Slowdive - A New Dream by Darren (MusicManic). This show was part of a few gigs for Band Explosion 91 at the Marquee in London. A number of bands including Chapterhouse and 530 played along with early Manics headlining. Two TV shows were on BBC2, they were also live on the radio"
The Slough Festival featured The Fall, Ride, Slowdive, Curve, The Mock Turtles, Chapterhouse, Revolver, Thousand Yard Stare, Ratcat and Soul Family Sensation. Audience video (see below) recording circulates. SLOWDIVE are pretty much a disaster. Under smoke and lights, emerging from the dark in some concert hall, they can assume the fascinating hypnotism of mantra. But exposed blinking to daylight, their magic dissolved. Poor Rachel sang so out-of-tune throughout that, although these things aren't supposed to matter in the hey-anything-goes wacky world of post-mod rock, it was frankly painful. "Catch The Breeze" just about survived the aural autopsy but "Morningrise" died and only Rachel's neat op-art dress and the unveiling of some new material ("Primal" and "Bright" or "Brighter") held our attention. I'm reliably and repeatedly informed they were incandescent (I think that's the word everybody keep susing) supporting Chapterhouse recently, so this was probably a one-off stinker, best forgotten. SLOWDIVE meanwhile are a big surprise, importantly, because, after all the pisparaging comments about Shoegazers, they are acquiring some identity. And what an identity it is... bot unlike, wait for it... Altered Images! How great is that? Rachel, dressed as a Modette, stands out front like Clare Grogan, swinging her arms around and looking impish, mischievous even. The crowd look wholly bemused, as the boys produce that whirly drone of sound that characterises their records, like 'Morningrise' and the climax to the set, 'Avalyn'. They waft dreamily around the field, and do something which sounds like 'I Could Be (Un)Happy' slowed down 1000 times. Thanks to Richard Spencer for confirming this date and for the flyer scan.